Digital Projection International (DPI) had made a major capabilities update to the fully-certified portrait and tilt capable TITAN 330 platform. By graduating to DPI’s latest NextGen electronics platform, the new TITAN 330 Pro Series 3 displays now enlist extensive Warp & Blend capabilities, 3G-SDI input compatibility, as well as specific models with high-performance 3D functionality. Available in SX+, 1080p and WUXGA native resolutions, the new TITAN 330 Pro Series 3 platform enables a new frontier of applications demanding both flexibility and performance. These newest TITAN Pro Series 3 displays will commence shipping in Q2, 2012 and carry an MSRP range between $34,995 and $64,995, depending on native resolution and 3D capability. Delivering up to 7,000 lumens of incredible brightness, the TITAN 330 and 330-3D platforms emerged from years of rigorously testing DPI’s displays in unconventional installation positions, the company says. With both landscape and portrait mode displays available, these projectors can be installed, depending on the model type, pointing straight up, straight down and anywhere in between, or at any side-to-side tilt angle, including full portrait orientation, with no degradation of lamp performance or lamp life. The TITAN 330-L’s “lens-over-tail tumble” capability defines TITAN 330-L units as solutions for any landscape application where the projector needs to be pointed up or down at a steep angle, such as dome venues or rear projection applications employing mirrors. Conversely, TITAN 330-P models are designed to operate at any side-to-side tilt angle, including full portrait orientation, with no degradation of lamp performance or lamp life. 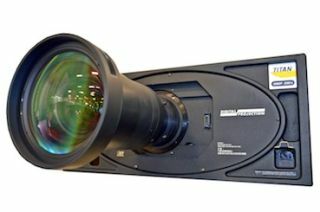 As with all TITAN models designated as “Pro Series 3,” the newly-updated TITAN 3300 projectors provide the user with advanced FusionExpress Warp & Blend capability, including the ability to make extensive geometric warp correction via the adjustment of an interpolated grid array of up to 16 x 16 nodes. Furthermore, up to eight warp maps can be generated, downloaded and stored within the projector’s electronics. On board adjustments for Pincushion, Barrel, Cornerstone, Vertical and Horizontal Keystone, and even Image Rotation, are also standard in the new LIGHTNING Pro Series 3D displays. Black Level Uplift in all non-blend areas guarantees uniformity across the screen, even when dark image content is displayed. Additionally, end users can choose to utilize the TITAN’s onboard tiling function by assigning each projector a position within an image matrix. The video processing then automatically extracts the appropriate segment of the input signal to be displayed by each projector in the array, and enables blending for the appropriate edges. In addition to the Warp & Blend technology now included in the TITAN 330 projectors, the TITAN 330-3D models incorporate DPI’s exclusive 3D advances, further extending the flexibility engineered within each display. Applications with 120 Hz native sources can utilize the High Bandwidth Input, eliminating the need for frame doubling. For 60 Hz 3D applications, DPI’s built-in Dual Flash Processing enables distribution of 3D content via 60 Hz formats by frame-doubling the signal within the projector. This produces the low flicker image characteristics of a native 120 Hz source without the infrastructure costs associated with distributing and switching ultra-high bandwidth signals. 3D sources operating at 48 Hz progressive (24 Hz per eye) can also be triple-flashed, resulting in a displayed frame rate of 144 Hz on screen.